We have been tasked with designing a facility to produce hydrogen from natural gas. I have attached a project brief for your perusal. We are a week away from starting the project, so are looking to simply get an idea of the potential mature technologies that could be used for the facility with respect to the project brief. Three primary techniques are used to produce hydrogen from a hydrocarbon source, such as methane. The techniques are: steam reforming, autothermal reforming, and partial oxidation. Each of these techniques has advantages and disadvantages which must be considered in choosing a final design. We need to produce three concept designs for the facility. Then we will analyse and evaluate them via a safety analysis, environmental assessment and economics analysis to determine the one taken forward to the detailed design stage. Are these most likely to be the three concepts? Or are there others that may work? Perhaps some reasons the above wouldn't be even considered in your view? It is also my understanding that different methods of steam reforming are counted as different concepts, so if that was an option I would value your view on what options would be available. Have you sent a technical proposal request to Licensors of the processes yet? Edited by Nikolai T, 04 October 2018 - 08:51 PM. as a professional of the refinery sector, I'd say that h2 from ng is produced by steam reforming. the project outline seems to suggest the identification of the 3 alternatives thru the energy / water / co2 savings. in this case, as nikolay highlights above, the study can only be performed with the help of licensors avilable to provide quite detailed data. - effluents, mainly co2 but also nox. Licensors will not provide detailed, and essentially confidential, information to students. Which of the three options is best depends mainly on the intended use of the produced syngas. the scope of work speaks about 23-28 knm3/h of h2 at 97.2%v purity to be provided at 18 barg to the hds units of the refinery (stanlow has an fcc-based processing scheme, no hck). the new unit would replace the existing ones, to be dismissed. so, steam reforming plus psa (or membranes?) is the choice. i agree that licensors won't provide data, unless the university has built-up some ways of cooperation. anyway, good universities have good libraries... with publications like PERP or similar. I previously had not noticed the attachment in message #1. Excess hydrogen produced by the new facility can be utilised in the on-site steam generation unit. Producing excess hydrogen and then burn it to generate steam is crazy, Producing excess hydrogen should be avoided by a proper control system. i agree. it shall be a misprint...maybe "hydrogen" could be read as "steam". Edited by gegio1960, 05 October 2018 - 01:24 PM. You can usually find licensor's public information in published literature. I don't know what details you are required to include in your study. The devil is in the details. You are unlikely to generate accurate capital cost for the facility, so you need to carefully choose how you will derive the cost. When you finalize all the information, you should find that conventional steam/methane reforming is the most cost effective. Also, your results should confirm that PSA is the choice for hydrogen purification. And you will get 99+% purity. Handbook of Petoleum Refining Processes Robert A. Meyers. My early suggestion won't interest Licensors obviously, because it’s only for study purpose. I appreciate the replies so far. For the WGS section, is it preferable to have both the HTS and LTS, or simply a single HTS? I understand that the HTS favours the kinetics of the WGSR, and that the LTS favours the thermodynamics. Some information is suggesting that HTS alone is a more modern approach, and that LTS is mostly used to increase throughput. I have no idea whether 50-60 tonnes of finished product requires an LTS, but only that the amount is tiny in comparison to what was being produced in the report case. Hydrogen will be required for the HDS, and I am unsure as to whether recycling some of the product from the facility is the way to approach this. Although we are not meant to ask academics at the University, someone else did mention that one of them said to “Buy it in.”. I have no idea whether this is or isn’t a better option, so I am left wondering whether it is safer to do that than recycle it? Or perhaps whether it is to do with the pressure requirements? Condensate will be produced after the WGS and prior to purification. At the amount we’re likely to produce, would It be more sensible to send it off-site for water treatment? Or would treating it on-site and using it for steam be the better choice? You can chose to have a single HTS, or an HTS plus an LTS, or a single MTS, but not a single LTS. Some information is suggesting that HTS alone is a more modern approach, and that LTS is mostly used to increase throughput. I would say: an MTS is the more modern approach. Normally an SMR includes a stripper for its own condensate which is then reused as BFW in its steam drum. Whether that makes sense in your case (small SMR) is normally discussed with the client as it depends on the specific design and spare capacity of its offsite utility systems. For your student project it is easiest to assume that it can simply be sent to off-site, and import all BFW for the steam drum from off-site. You may find some pointers reading the document attached . Edited by breizh, 15 October 2018 - 05:33 AM. I agree that MTS is the most modern approach, but it says to use proven technology. Apparently the catalyst option isn't as tried and tested as for HTS and LTS reactors. So I think for now it is going to be a single HTS reactor. I was referring to recycling hydrogen, such as from the product line downstream of the PSA unit. Sorry if it wasn't clear. I understand the reactions taking place, hence asking about the impurities in the condensate. If it was to be removed, is this via a deaerator? 1) I am sure that Haldor Topsoe uses MTS. Recycling additional hydrogen to suppress hydrogen production capacity is not a good idea as it wastes energy. 3) Normally a steam reformer has a stripper column to remove volatile impurities (H2 , CO , CO2 , methanol, ....) from the condensate. If the deaerator in the off-sites has enough trays or packing height it might also do the trick. Question is whether client wants to risk that. I have attached 'Hydrocarbon Processing - Gas Processing Handbook 2012'. From page 112 - 127, there are various options for reformers. Which would you advise? 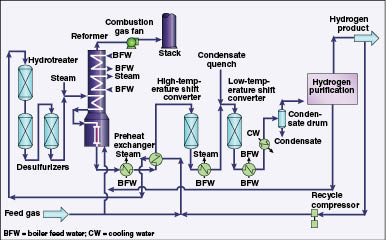 Those are not options but very simplified flowschemes of designs by various steam reformer licensors. Chosing a licensor for a specific project would involve extensive communication with several licensors. You are doing a student project, right? So you will be designing a rather generic steam reformer based only on info that you can find in books, articles or the internet. It is not clear to me how detailed your design needs to be, but in any case you can only use what you can find, so if you happen to come across interesting and detailed info about a design by licensor X then I suggest you use the flowscheme of licensor X.
I am not too sure how those marking will perceive it. Just reading on the advantages and disadvantages of various types, and the one I have started to draw in AutoCAD is apparently a down-fired type, which is prone to coke formation at the inlet as the combustion is mostly in one place unlike say a side-fired type. Although I think we would use S/C = 3 in either case, so I am not sure whether it is worth worrying too much about. Other types apparently require more catalyst though. the one I have started to draw in AutoCAD is apparently a down-fired type, which is prone to coke formation at the inlet as the combustion is mostly in one place unlike say a side-fired type. Most licensors use top fired (down fired) furnaces and therefor most SMR's in the world do too. You should not loose any sleep over that. As far as I know only Haldor Topsoe uses side-fired furnaces. Only Foster Wheeler uses terrace wall furnaces. I am trying to use the above thread as a guide to perform the mass and energy balance for the process. In that thread, they aren't using a pre-reformer, and I am wondering whether the approach is different? I know the same reactions occur in the pre-reformer as they do in the reformer, so it is essentially the same approach in that sense. But the pre-reformer is said to be adiabatic, so I am unsure if that changes the approach to the calculation. Pre-reformer equilibria are the same as for the Reformer oulet. Pre-reformer is adiabatic so the simplest way is to assume an outlet temperature and calculate the associated inlet temperature from the heat balance. If that inlet temperature is not quite as you want it, assume another outlet temperature and redo. That is basically the approach I suggested for the HTS (which is also adiabatic) in that other topic. Attached is the initial feed composition, with an ideal gas assumption. Then the mass balance across the HDS, assuming a 2% excess hydrogen and 100% conversion of mercaptans. Mass balance for the desulfurisation then follows, also assuming a 100% conversion. I have then taken S/3 as 3 and tried to calculate the amount of steam to be added in the same way as was in the thread above. Is that correct based on the assumptions made (i.e. the correct pre-reformer inlet)? Is it necessary to add steam prior to both the pre-reformer and reformer? Would they both be S/C of 3? When you say "2% excess hydrogen" you mean 2% recycle hydrogen? Seems low to me especially in view of the high sulfur content of your feed. Moreover I doubt that the high amount of H2S from the HDS can be handled with only ZnO. You better check whether the NG feed to the SMR really contains so much H2S and CH3SH as that seems unlikely to me. Add enough steam to Prereformer to have an S/C of at least 2.0 at its inlet. Rest of steam is added to Reformer. Chose Prereformer inlet temerature of at least 450 oC and outlet temperature of max 500 oC. Add a Prereformer pressure drop of 1.5 bar to the pressure profile. I noticed 5% was suggested as the amount of hydrogen recycle in the other thread, but we have been told to use 2% at the concept design stage. Managed to find one reference for it, although it is based on an ASPEN simulation of a hydrogen production process. We have chosen to use ZnO for simplicity at this concept design stage. Shall mention in the notes section of the PFD that the number of units is TBD, but is likely to be two rather than one. Amount of H2S and CH3SH is set by the project brief, and we were told to use the upper limit as a worse case scenario at this stage. Unless we have made an incorrect conversion. Why is the S/C of 3 split between the prereformer and refrormer? What would be the negative to adding it all at the prereformer? For the hydrogen recycled from the product line downstream the PSA unit, what pressure does it need to be relative to that of the natural gas entering from the BL? Does it need compressing to the same pressure? Similarly for the PSA offgas. If it is presumably leaving at around 18 bar similar to that of the hydrogen product, does it need to be increased prior to entering the reformer? In that other topic I mentioned 3 - 5 %. That is based on what I have seen in designs by reputable licensors. It would be absurd to feed natural gas with 600 ppm H2S in it to the SMR. Most of that H2S should be taken out upstream the SMR. The HDS reactor inside the SMR is intended to convert only traces of mercaptans into H2S and the ZnO beds are intended to remove only small amounts of H2S. I advised at least 2.0 at Prereformer inlet. You can use more or even all steam if you like. Prereformer catalyst volume will then need to be bigger due to bigger volumetric flowrate. The designs that I have seen usually had part of the steam after the Prereformer. One design with an MTS, and therefor an overall S/C ratio of only 2.5 , used all steam upstream Prereformer. See the pressure profile that I listed in the other topic. The PSA tailgas leaves at only approximately 0.3 barg, just enough to feed the furnace burners. Edited by PingPong, 06 November 2018 - 03:19 PM.